Photograph depicts wreckage from the collapse of the Second Narrows Bridge (later renamed Ironworkers Memorial Second Narrows Crossing).Scarred surface of concrete platform; water, out of focus, in background. 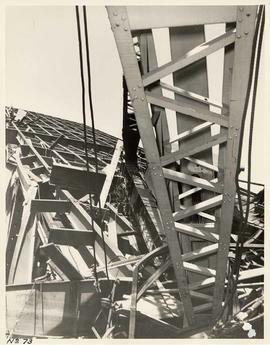 Photograph depicts wreckage from the collapse of the Second Narrows Bridge (later renamed Ironworkers Memorial Second Narrows Crossing).Close up of splintered wood, twisted metal, and solitary bolt. Photograph depicts damage to the Second Narrows Bridge (later renamed Ironworkers Memorial Second Narrows Crossing) after its collapse.Riveted metal girder labelled "BOTTOM OF EAST LEG" and "EAST FACE" resting on gravel surface. 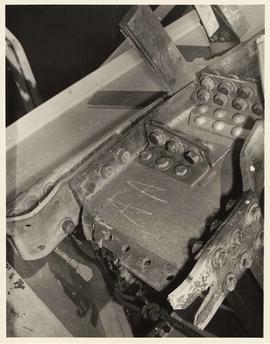 Photograph depicts damage to the Second Narrows Bridge (later renamed the Ironworkers Memorial Second Narrows Crossing) after its collapse.Distorted piece of metal, labelled "#5" with chalk.